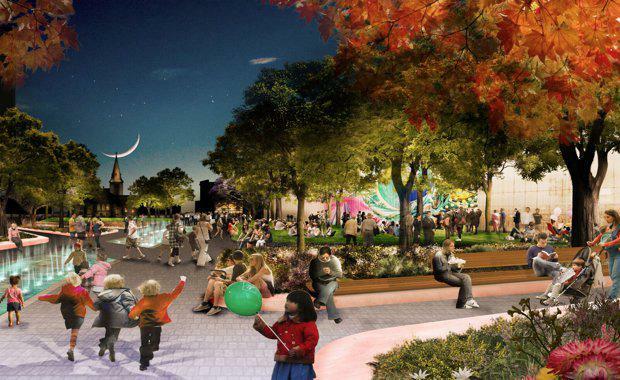 Parramatta City Council last night voted to endorse the Draft Concept Design for a four-week exhibition period to seek feedback from the community and stakeholders. The $35 million investment by Council is central to the $2 billion Parramatta Square redevelopment that will include commercial, residential, educational and civic buildings. Key to the concept design is a central fountain and watercourse that winds through the length of the 10,000sqm space. While the final design is still to be determined, the stream could take on a variety of forms including still water, running water, a shallow curtain, mist or spray. “As a river city, Parramatta has a long and well-established connection with water and this design pays tribute to that, with a water feature that lends itself to a variety of different interpretations,” Lord Mayor of Parramatta Cr Scott Lloyd said.